I’ll jump right in today and first tell you that there was an important food summit in Milan this week. American media distracted us with local politics, so we didn’t hear much about it. It was an important summit, however, that holds possibilities of long-term ramifications in the food industry with the potential of effecting policy worldwide. We should be alert to changes to our food system in addressing food waste, food packaging, and world hunger. I haven’t digested (sorry for that) all of the information, so I’ll come back to some thoughts on my perspective of the proposed changes in future posts. However; it’s important to stay alerted and informed. Many ideas sound good until put into action. I mean, who wouldn’t want to end global hunger? A toaster and blender are essential. They don’t need to hide behind cupboard doors. Especially the ones, when we are apt to use them every day. I don’t know exactly when we started to think they had to be off the counter and out of sight, but having to get them out and then putting them back eats up time. Five minutes saved here and there over the course of the day and week adds up. Standing on its merit, consider what we can do with five minutes. 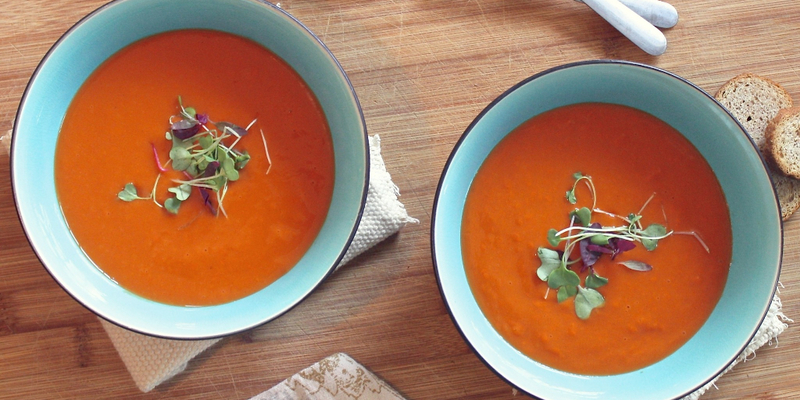 Buy pre-made, basic, organic boxed soups to have on hand for any occasion. I like the brand, We can add ingredients to a box of broth, tomato, or another vegetable-based version. Roasted red pepper is my favorite. Add herbs to make it taste even better. Today we can buy “fresh” pre-cut veggies to throw in. Add bread and salad, and we have a complete, easy, satisfying meal for any time of the day. Even breakfast. Pasta tomato sauces are one of the most versatile items to keep on hand. I find them to be completely bland, but in the long run, economically and truly versatile. It’s not hard to add some herbs for flavor. One jar can be used to drizzle over an omelet; dress a quick batch of pasta; or – wait for it – the foundation for tomato soup! So much better than any canned, condensed version with added sugars. I stir in a little cream, grated carrot, and sprinkle with parmesan cheese. If time provides, chop up onions and ham, sauté lightly and add to the bowl. When I was in Delaware taking care of Betty, people would stop in and watch my salad making. Chop, chop, chop. They would be in awe. Honestly, I only chopped up salad greens, miscellaneous veggies or fruits and sprinkled the whole thing with packaged trail mix. I’d whisk together oil and vinegar; honey; herbs and salt and presto! I had a dressing. Sometimes, I’d whisk in yogurt. However, for those times that speed was an issue, I kept bottled dressing available. My eye was always to put together nutritionally dense meals in the shortest amount of time. 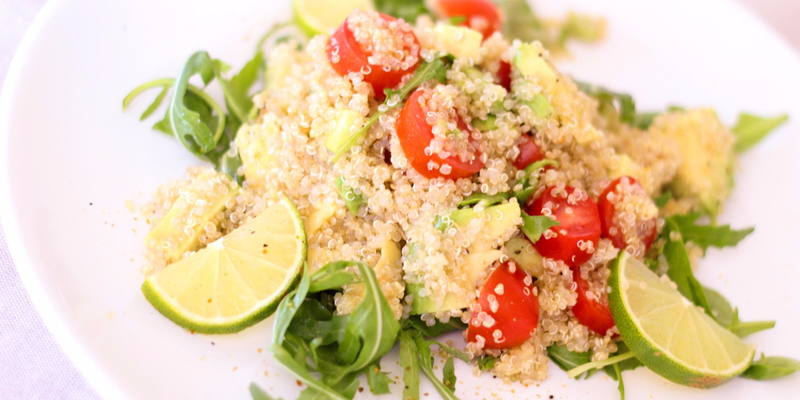 Quinoa is an inexpensive, valuable asset for the caregiver as a good source of protein, fiber, iron, copper, and antioxidants. Make a large batch and use it as morning cereal; a side dish in place of lower nutritional value rice; or scoop it into a serving of soup. Remember, when the time is too short to do chopping duty, pre-chopped is available today in most stores. It’s marvelous to be able to have a full course meal with all of the fixings. However, the role of caregiver is to take care of self, along with our caree. Often, we are on our own and self-survival is key. Caregiving isn’t a race, even though it often feels like it. Enjoyable, simple meals go a long way in encouraging us to stay healthy.